Vasubandhu (Sanskrit. Chinese 世親. 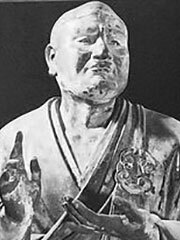 Korean 세친) was an Indian Buddhist scholar-monk, and along with his half-brother Asanga, one of the main founders of the Indian Yogācāra school. Vasubandhu is one of the most influential figures in the entire history of Buddhism. Born in Gandhāra in the fourth century, he was at first a Sarvāstivādin when he initially studied Sarvāstivādin Abhidharma, as presented in the Mahā-vibhāsa. Dissatified with those teachings, he wrote the Abhidharmakośa in verse and his auto-commentary, the Abhidharmakośa-bhāsya, an important summary and critique of the Mahāvibhāsa from the Sautrāntrika viewpoint. Some modern scholars, notably Frauwallner, have sought to distinguish two Vasubandhus, one the Yogācārin and the other a Sautrāntika, but this view should probably be rejected now on the basis of the anonymous Abhidharma-dīpa, a critique of the Abhidharmakośa which clearly identifies Vasubandhu as the sole author of both groups of writings.